Reishi. An Adaptogen Chai Tea. We love chai in this house! My two year old even asks for it..... every. single. day. My sister-in-law makes fun, saying we’re hipsters because our toddler sips chai all of the time. It’s pretty funny but for real, this aromatic beverage is one of my favorites which is why my kids find it to be a good way to start the fall and winter mornings too. It’s so incredibly comforting and warming to not only my body but also my mind. I feel embraced with each sip I take and I can rest in its flavor and aromas. I love visiting the memories I have holding a cup of this warm, spiced Indian tea between my palms. 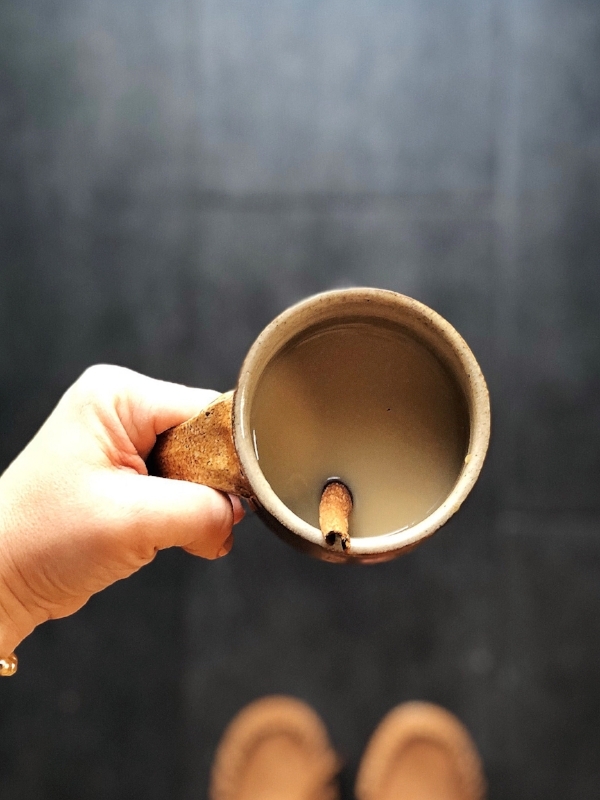 Chai tea is good for so many different things and I'm going to break down the herbs we are using in this chai recipe so you can get a clear picture of just some of the benefits each herb contains. This healing spice is a carminative, making it helpful for digestion and preventing gas and bloating. Allspice is an anti-inflammatory and assists in relieving inflammatory conditions such as pain in joints, muscular aches and pain, and gout. It is an antioxidant, good for the heart, boosts the immune system. Not only does cinnamon make most things taste better, it also regulates our blood sugar making it ideal for diabetics. Cinnamon aids in stomachaches while reducing gas and bloating. It is anti-fungal, antibacterial, and an antimicrobial. Cinnamon aids in weight loss as well as lowering LDL cholesterol and triglycerides. It can soothe our throats when we have colds and coughs. Cinnamon is also warming, increasing circulation. These aromatic pods contain vitamins such as C, B6, Riboflavin, and Thiamin. Cardamom also contains minerals like manganese and zinc. It is beneficial to respiratory problems such as asthma. Cardamom is also a wonderful digestive support after a big meal. It prevents gas, bloating, nausea, and provides relief from hiccups. Clove is a topical analgesic and anti-inflammatory. It is an anesthetic, great for naturally numbing sore gums and toothaches. Also, as an antibacterial and anti-fungal it can be useful in instances of gum disease. Nursing mothers can take clove internally to help their colicky babies. Pepppercorn is a digestive stimulant, increases nutrient absorptions, and is a carminative. It contains minerals such as manganese, potassium, calcium, zinc, and magnesium. You can also find vitamin C, A, and B-complex within it and antioxidants to help fight free radicals. This magical little star is actually a fruit! Star Anise is known to be naturally anti-fungal, antibacterial, and antiviral. It improves circulation, helps in reducing blood pressure, and is a carminative therefore it assists in digestion, gas, and bloating. Ginger is an antioxidant and anti-inflammatory. It strengthens the immune system and assists in lowering blood pressure. Ginger is a carminative and digestive aid that reduces nausea, motion sickness, morning sickness, bloating, and gas. It improves circulation with its warming quality. All of the spices that I have listed are amazing on their own but together they work in a synergistic manner to bring us wholeness and balance. One of the common threads in all of these herbs is that they assist in digestion making chai tea an excellent choice for an after meal digestif tea. Last but not least, the thing that makes this tea so darn special compared to other chai teas is that its cooked with Reishi! My two year old was actually part of the reason I made this recipe because I wanted to give him chai that didn’t have caffeine in it and that would also nourish him deeply. Reishi is a mushroom that grows on the side of Oak and Maple trees. It is a powerful and healing Adaptogen that is useful for stressed and anxious individuals. Adaptogens normalize the HPA axis function as well as enhance the thymic function. They are helpful in treating the overtired, overworked, and depleted individual who has nothing left to give but keeps going. Reishi is a balancer to the immune system that can be used to treat immune deficiency, immune excess (allergies) or hyper/hypo-immune conditions such as autoimmune diseases. Reishi is mixed with other herbs to assist with preventing altitude sickness when taken weeks before arriving to the higher location and can be used to help regulate the heart rate. Turn heat on high until the tea reaches a boil. Lower heat and simmer for 20 minutes. Strain and add milk and honey to taste. I especially like maple syrup in mine. Enjoy hot or on ice! Please share your experience with this recipe....I love getting your feedback! Elder is an amazing plant. If you don't know a whole lot about it, read on! Elderflower was historically used to reduce inflammation and as an antiseptic. It's most commonly used for helping ease colds, flu, respiratory problems, allergies, and even sinus infections. Elderflower has antibacterial and antiviral properties which also help to boost the functioning of the immune system. It is naturally containing laxative properties to help relieve the occasional constipation. The flower can be made into a tea and used orally as an antiseptic mouthwash. Traditionally Elderflowers are also used for treating fevers in children. 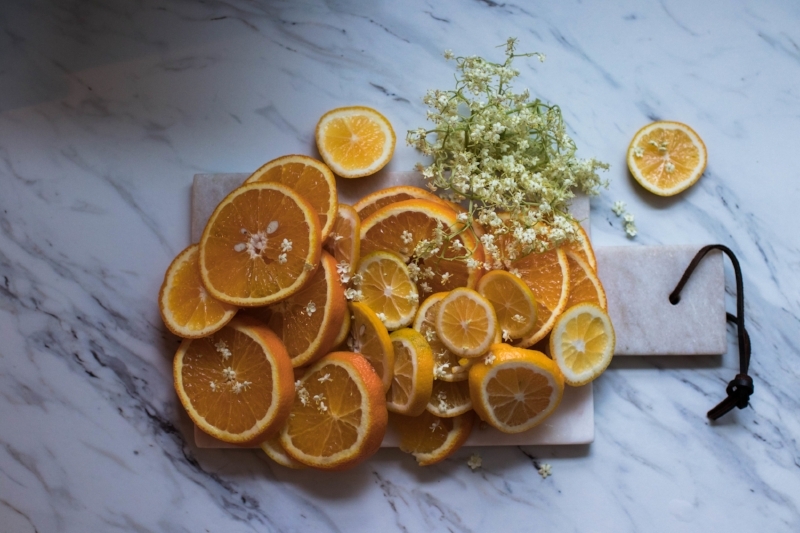 Elderflowers are rich in bioflavonoids mostly flavones and flavonols which are known for their anti-inflammatory and antibacterial properties. They contain triterpenoids which are helpful as an anti-inflammatory and as an analgesic. Both the flowers and berries in the Elder plant can be used when PROPERLY prepared, but all leaves, sticks, and roots should be avoided. Now that you have a brief understanding of just how amazing these plants are, lets get started! I have been having fun making new recipes with the fresh Elderflower I have had around! I have three recipes for you to try and I think you will love all of them! *At the time that I wrote this blog, it was late Spring. Right now you can still purchase Elderflower that is dried but finding it fresh will be unlikely at this time. Gather your fresh Elderflowers in June when they are blooming! 1. Put 1 quart of water and the sugar in a pot and warm slowly, stirring to dissolve the sugar. 2. When dissolved, bring to the boil. 3. 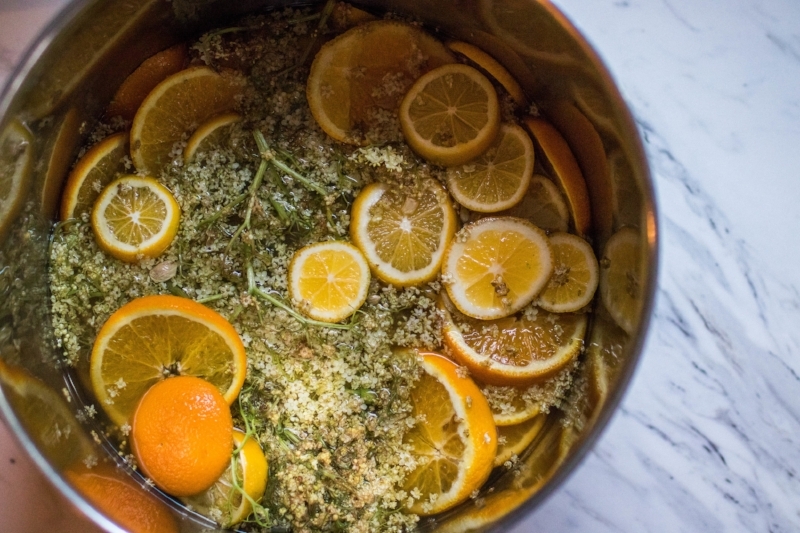 Remove from the heat and add the fruit and flowers, stir and leave covered in a cool place for 24 hours to infuse. 4. When time comes strain the cordial into clean bottles, refrigerate and use within two weeks. *this Cordial is great to mix into teas, juice, cocktails, pour on desserts, or turn into an ice cube to throw in your Bellini or white wine! Elder & Oats. A nourishing morning porridge. 1. Mix together the oats, water, salt, and coconut oil into a small saucepan and cook on medium heat. 2. Stir the mixture until it begins to bubble and the oats soften. This should take about 5 minutes and the mixture should look thick and creamy. Add more milk or water if you prefer a thinner oatmeal. 4. Pour the cooked oats into a bowl. Drizzle with your milk, maple syrup, bee pollen, chia seeds, and cinnamon and remainder of your Elderflower. 1. Snip the flowers from a bag of elderflower heads getting rid of as many of the stalks as you can. 3. Add a few curls of orange zest on top to stop the flowers being on top. 4. Fill to the very top with vodka. 5. Screw the lid on tightly and put it somewhere dark. 6. Shake once or twice a day. 7. If possible make sure no blooms are sticking out of the liquid or they will brown. 8. After 4-5 days sieve out the flowers and orange. 10. Put it back into the jar and add at least ½ a cup of sugar per quart of liquid. 11. Shake and leave to dissolve for a few hours. Teething Pops. For the Babes. It has been a challenging week because my little guy is teething like crazy. He typically doesn't seem to react to his teeth coming in which I believe is from the Baltic Amber necklace he's worn since he was three months old. For whatever reason, the only thing that is helping him now are the teething pops that I have been making for him. The pops are made from one of my herbal teas Mama's "Calm" Tea Blend..... with a small amount of honey used to sweeten, soothe sore gums, and enhance the flavors of the herbs. The popsicle mold that I like is perfect for little mouths and is available here. If you are interested in purchasing this blend please send me an email on my contact page. I do not have an online store set up yet so all orders can be done through email and billed through PAYPAL. 1. Put the tea blend in a tea strainer and into a 1 quart mason jar. 2. Add hot water and cover for 15 minutes. 3. Strain and add a small amount of sweetener. 4. Let cool to room temperature. 5. Pour tea into mini popsicle molds and put in freezer. 6. Left over tea will last a few days in the fridge so you can refill pops as needed or just drink as an herbal iced tea. * I am an associate through Amazon and I do receive commission for the products you order through my links at no extra cost to you. That being said, I give my promise to only market products to you that I fully believe in and have used myself. 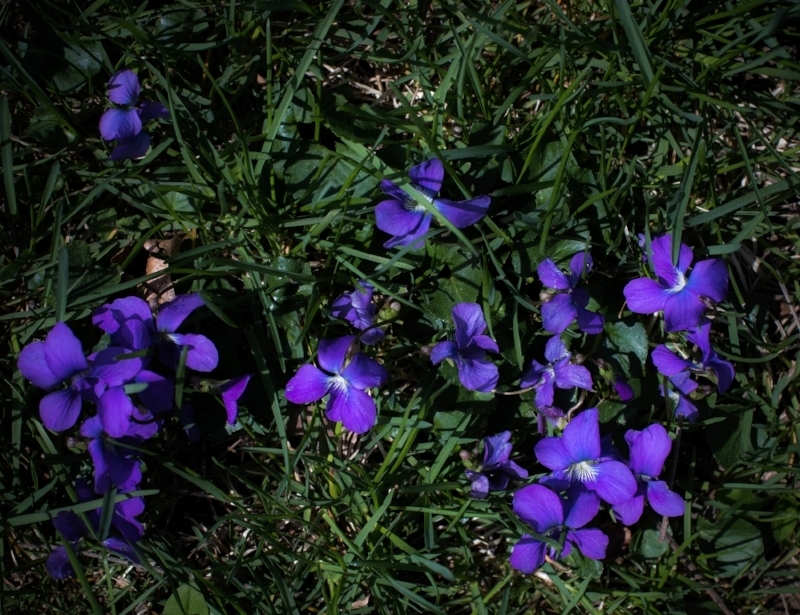 Violets and Dandelions. Photo by FreeDom Danielle Flowers. I love this time of the year. Nature is blooming into life and rebirthing. As the forests blossom so does this giddy feeling inside me that comes out at this time of the year. It's primal; it's vibrating with life...I feel a rebirthing of my own being, glowing with creativity and joy for the life returning all around me, within me. The newness of it all that feels similar to falling into new love. Along with all this excitement I also feel a bit challenged. The seasons tend to remind me to be unattached and to be present with what I am experiencing then and there. I like to believe I'm someone who can remain unattached to things, be all zen, and like Buddha...but I'm not, not even close. I'm reminded of my humanity when the transitions of my favorite seasons bring me tinges of grief because I get attached to them. To be honest, I am ok with having some attachment to our four seasons. The passion that comes with that attachment reminds me that I am alive. Seasons change whether I get attached to them or not and I always adapt pretty quickly to the next coming season. Although I feel like I am saying goodbye to a loved one, I know we will meet again and I am so grateful to live in a place that has such distinct seasons so that I can really immerse myself into each one. Recently I decided to preserve Spring so that I can enjoy it until it finds its way back through the cycle. Foraging is a wonderful way to do this because the herbs can be preserved to enjoy in even the coldest, darkest days. If you've read my guide, Wild Spring Edibles. A Starter Guide, you know about a few of these. Medicine in the making. Photo by FreeDom Danielle Flowers. The following recipe is a delicious and pretty syrup that can be used for months after spring is over. Violet Syrup. Yes, that is what I said and it IS as awesome as it sounds. It can be used in making lemonade, sweetener for tea, in cocktails, add it to seltzer, pour over pound cake or pancakes, use it in making desserts, or whatever else sounds good to you. I love that I can save spring in a bottle and savor it for months to come and I hope you do too! Violet Syrup and a refreshing Spring beverage. Photo by FreeDom Danielle Flowers. 1. 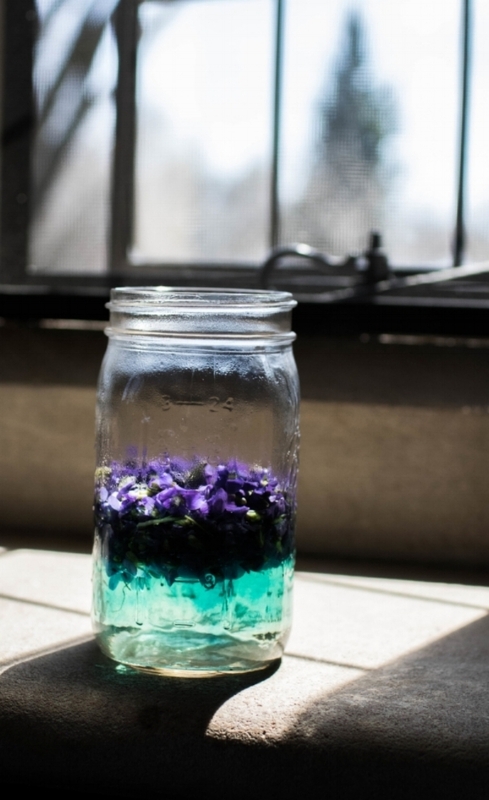 Put your violets in a mason jar. 2. Pour all of the boiling water over your violets. 3. Cover and let steep over night for 24 hours. 4. Strain the violet water into a pot using a fine mesh screened strainer. Squeeze as much of the liquid out of the flowers as possible. 5. Add the sugar to the violet water and cook over medium heat until sugar is dissolved. 6. If you want to make your syrup a bit more magenta in color, add some lemon and watch it slowly transform in color. Only add a tiny bit at a time because it does change it fast. I personally like the lemon for an added flavor. Wild Spring Edibles. A Starter Guide. Violet lemonade. Photo by FreeDom Danielle Flowers.